make it perfect: .Janelle's A+ Skirt. 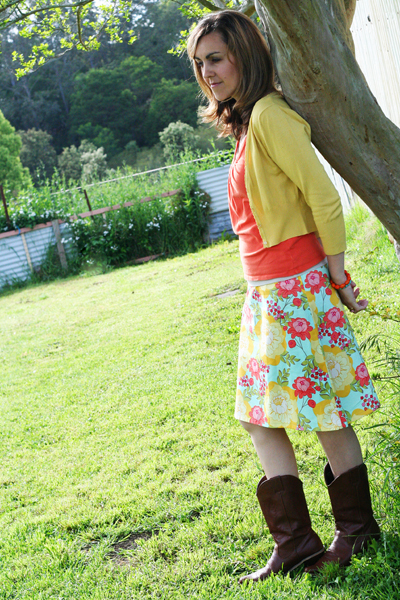 My lovely friend, Janelle Wind was one of my pattern testers for A+ Skirts. I was keen to find a pattern tester who would be able to test the skirts on a "tween" as it is the first time I have designed a pattern for that age/size and needed to make sure I was on the right track. Lucky for me, Janelle was excited to sew up a skirt for herself as well so I got to get feedback from both perspectives. Here is Janelle's skirt. Hasn't she done a marvelous job? I LOVE the fabric she has chosen - perfect for saying hello to spring. Apart from the skirt being so awesome (this is View A, by the way) I am also love, love, loving Janelle's whole outfit - very spunky!! Janelle has a super cute daughter, Emily who also models a funky A+ Skirt. You can read more about Janelle's skirt and see photos of Emily's skirt also here. Thanks Janelle and Emily! Your skirts are great!